British Columbia Electric Railway Company's (BCER) #1225 was built by the St. Louis Car Company in 1912 and arrived in Vancouver, B.C. 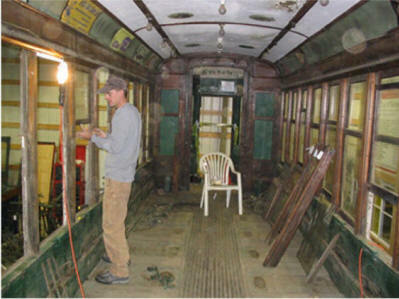 via railcar in November of that year. In order to save custom duty the car came minus all motors and electrical apparatus required to operate the car. Thus, it was in the late spring of 1913 that the completed interurban began regular passenger service for the BCER on either the Steveston-Vancouver run or, occasionally, on the Burnaby Lake run. On February 28th, 1958 at a little after 1:00 am BCER 1225 pulled into Marpole Station on a regular passenger run. It discharged its paying passengers (mostly rail fans) and the interurban service in greater Vancouver ended. An era had passed. Later that year 1225 was sold to the Orange Empire Railway Museum in Perris, California and remained in their collection until purchased by the Fraser Valley Heritage Railway Society of Surrey, B.C. in August, 2005. 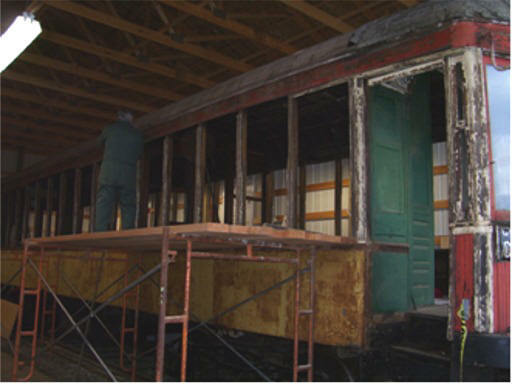 Since its arrival back to British Columbia from the OERM collection (see RyPN news brief on 8/15/05), BCER # 1225's rehabilitation is progressing in a most satisfactory manner. First to come off were all the exterior doors, trapdoors and seats. Slot screws attached each seat to the floor and side panels. Most had a heater underneath which was joined to an electrical conduit. As such the removal of each seat was a time consuming job. But the job was completed in high spirits. First to come off were all the exterior doors, trapdoors and seats. 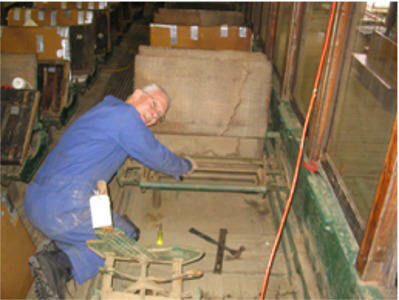 FVHRS volunteers Ron Jones (above) and Neil Wilkie (below) work on seat removal. All photos by Robert Ashton. After the heater wiring conduits were removed, the lower interior side panels and molding were detached. Because of a large structural north-south piece the paneling under the windows is met with a molding and goes inward 90 degrees where another panel segment continues to the floor. There is a joint/crack where they all meet and over the years passengers have lost items like coins, some of which slipped between the cracks. Long lost Canadian and American coins found in the cracks and crevices of 1225. The oldest coin volunteers found was a Queen Victoria penny lost, perhaps, by a young Canadian heading for the trenches of WWI. 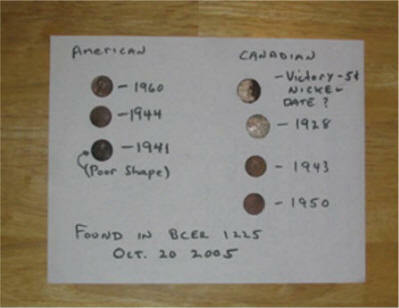 Other coins found were both Canadian and American: A testament to the joint ownership. Transfers and "fare paid" slips of paper were also found. Retired BCER motorman Frank Horne finds interesting word and date. Another interesting item was found when retired BCER motorman Frank Horne was removing a portion of one of the bulkheads. 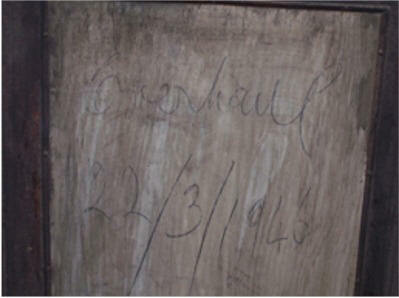 On a piece of plywood, that appears to have replaced some glass, was the date 22/3/1946. Another fragment of the car's past history. Early inspection had shown that, for the most part, the window frames in 1225 are in sad shape, the years in the dry California sun having taken their toll. The window frames will be replaced with original mahogany and all the windows will be updated with safety approved glass. 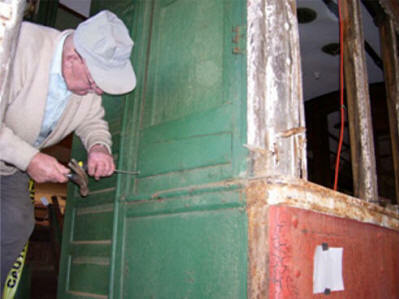 Volunteer Brent McIvor helps remove window frames and moldings. However, one of the most pleasant surprises was found when all the interior ceiling panels were removed. 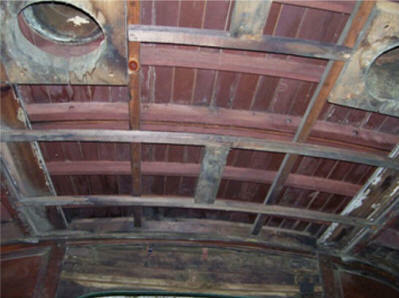 The roof supports and the wooden roof strips appear to be in excellent condition. Thus, the roof will remain as is, with only slight repairs and later will be recovered with a new exterior canvas and waterproofing. 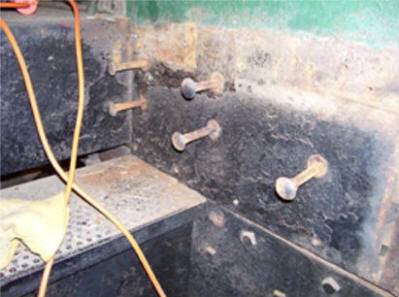 In order to assess the condition of the wood frame that the steel side plates are attached to, the plates must be removed. The steel side plates are also attached to the window uprights/roof support and these all need to be replaced with oak, matching the originals. Plate removal is a challenging job as not only are the plates held on with carriage bolts and rivets but also hundreds of slot screws. 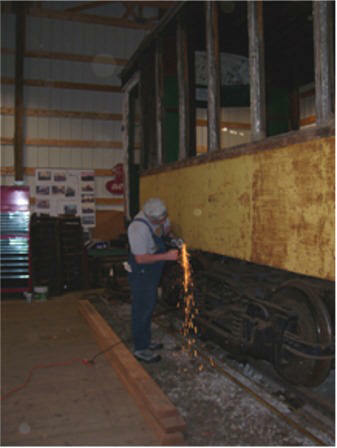 Carriage bolts and rivets are removed from side plates. Numerous methods are being used to remove the screws: by hand, by a pressure punch or by drilling off the head. Once again the volunteers attack the job with enthusiasm. It is hoped the side plates will all be removed by the middle of January, 2006. Volunteer Lloyd Knoblauch removes upper exterior fascia. We have been blessed with a mild, albeit, wet winter, this year. As a result the crew of volunteers have been able to work in relative comfort in our unheated car barn. 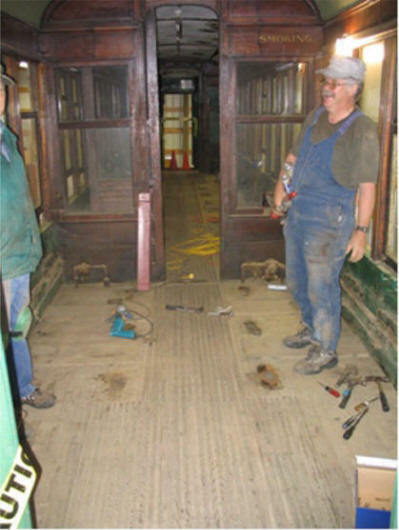 All volunteers and members are looking forward to the new year and continued progress of the rehabilitation of the car that ended Greater Vancouver's interurban era.